As in past years, the Development Policy Centre hosted a forum to discuss and debate recent Australian aid evaluations. This year we focused on the new annual report on Australian aid Performance of Australian Aid 2013-14 and on two recent evaluations from the Office of Development Effectiveness (ODE) on Australia’s responses to humanitarian crises in the Horn of Africa and Syria. We heared from ODE and the Chair of the ODE’s Independent Evaluation Committee. 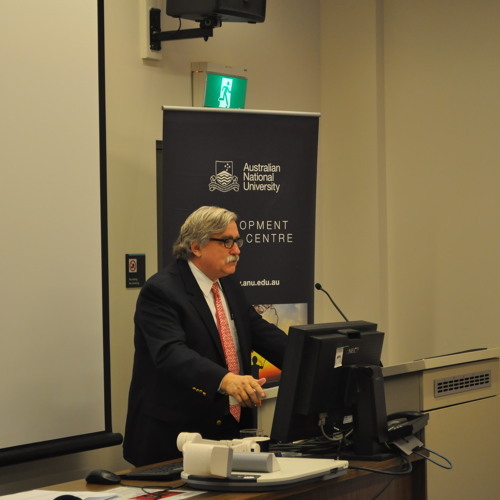 Speakers included: Mr Jim Adams Chair of DFAT’s Independent Evaluation Committee and former World Bank Vice President. Mr Scott Dawson First Assistant Secretary, Contracting and Aid Management Division, DFAT. Mr Simon Ernst Office of Development Effectiveness, DFAT. Professor Stephen Howes Director of the Development Policy Centre and Professor of Economics, Crawford School of Public Policy, ANU. Mr Jamie Isbister Acting First Assistant Secretary of the Humanitarian Division, DFAT. Dr Karen Ovington Assistant Director for the Office of Development Effectiveness, DFAT. Mr Dereck Rooken-Smith Assistant Secretary for the Office of Development Effectiveness, DFAT. Ms Joanna Spratt PhD Candidate, Crawford School of Public Policy, ANU. This forum was presented by the Development Policy Centre at Crawford School of Public Policy, The Australian National University.